Robots are cool. Fact. But can they keep you interested for more than a short time? Over months? Years even? Roboticists (thats what we're called) have found it hard to keep humans engaged with robots once the novelty wears off. They're either too simple and boring, or promise too much and disappoint. 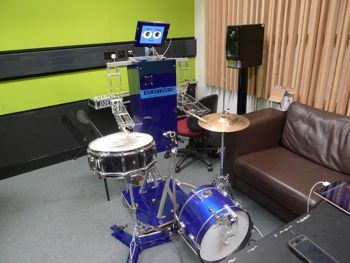 So, at Queen Mary University of London we've built a robot called Mortimer that can not only play the drums, but also listen to humans play the piano and jam along. He can talk (a bit) and smile too. We hope people will build long term relationships with him through the power of music. Robots have been part of our lives for a long time, but we rarely see them. They've been building our cars and assembling circuit boards in factories, not dealing with humans directly. Designing robots to have social interactions is a completely different challenge that involves engineering and artificial intelligence, but also psychology and cognitive science. Should a robot be polite? How long and accurate should a robot's memory be? What type of voice should it have and how near should it get to you? It turns out that making a robot interact like a human is tricky, even the slightest errors make people feel weird. Just getting a robot to speak naturally and understand what we're saying is far from easy. And if we could, would we get bored of them asking the same questions every day? Would we believe their concern if they asked how we were feeling? Would we believe their concern if they asked how we were feeling? Music is emotionally engaging but in a way that doesn't seem fake or forced. It also changes constantly as we learn new skills and try new ideas. Although there have been many examples of family bands, duetting couples, and band members who were definitely not friends, we think there are lots of similarities between our relationships with people we play music with and 'voluntary non-kin social relationships' (as robotocists call them - 'friendships' to most people!). In fact, we have found that people get the same confidence boosting reassurance and guidance from friends as they do from people they play music with. So, even if we are engaged with a machine, is it enough? People might spend lots of time playing with a guitar or drum machine but is this a social relationship? We tested whether people would treat Mortimer differently if it was presented as a robot you could socially interact with or simply as a clever music machine. We found people played for longer uninterrupted and stopped the robot whilst it was playing less often if they thought you could socially interact with it. They also spent more time looking at the robot when not playing and less time looking at the piano when playing. 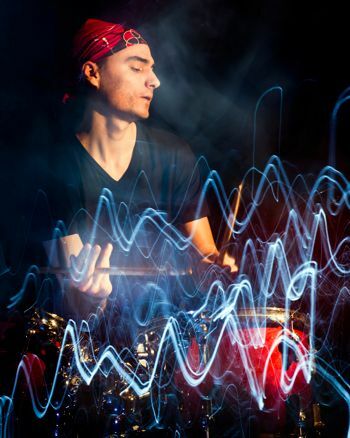 We think this shows they were not only engaged with playing music together but also treating him in a social manner, rather than just as a machine. In fact, just because he had a face, people talked to Mortimer even though they'd been told he couldn't hear or understand them! So, if you want to start a relationship with a creative robot, perhaps you should learn to play an instrument!